“Concussion” stars Will Smith and Alec Baldwin. Photo Credit: Sony Pictures. In the past few decades, the National Football League (NFL) has surged passed Major League Baseball as America’s pastime. On Fall Sundays, viewers are glued to their television sets to witness some of the world’s greatest athletes hastily run around the football field while delivering and absorbing violent hits, often bouncing back as if nothing happened. While more and more people were drawn to the edge of their seat due to NFL action, the owners and league profits skyrocket. Sadly, though, through news stories, Americans have learned that these hits had serious and sometimes fatal repercussions to many current and former players. Concussion is based on the true story of how the harmful effects of football hits were uncovered by an unknown doctor and his struggle to bring the truth to light amidst the NFL’s repeated attempts to discredit his research. This biographical sports drama follows much of the professional life of Dr. Bennet Omalu, a forensic neuropathologist, played by Will Smith (Focus, 2015). Based on the 2009 GQ exposé Game Brain, the story begins with “Iron Mike” Webster, a beloved Pittsburgh Steelers Hall of Fame player who falls from legend to outcast as his behavior becomes more erratic as a result of dementia. Upon Mr. Webster’s early death at the age of 50, Dr. Omalu’s intern, Prema Mutiso (Gugu Mbatha-Raw), is tasked with performing an autopsy and becomes fixated on what caused the rapid mental health decline of Mr. Webster and several other former NFL players. When compared to other investigative films, Concussion lacks a surprise factor or twist. While the film doesn’t score points in the script category, it makes up for it with the star performances, however. The budding love story between Omalu and Mutiso that progresses along the sidelines isn’t entirely necessary and almost takes away the focus, making it feel out of place. The film succeeds in deepening the conversation about this important topic without completely bashing the football industry and it does so in an appropriate run-time of 123 minutes. After making the medical discovery of chronic traumatic encephalopathy (CTE) and publishing his research, Dr. Omalu, a Nigerian immigrant, is surprised to find that the NFL and its ardent supporters are less receptive than he expected given the impact it is having on players of the most popular U.S. sports league. 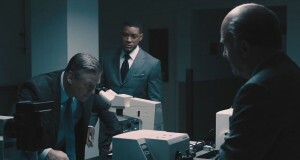 With the support of his mentor Dr. Cyril Wecht (Albert Brooks, A Most Violent Year, 2015) and a former NFL team doctor, Dr. Julian Bailes, played by Alec Baldwin (Still Alice, 2014), Dr. Omalu battles with the NFL who is seeking to discredit his research and refocus the attention back to the field. This film bears resemblance to the movie, The Insider (1999), where the “big three” tobacco corporations tried to bury scientific evidence that their product caused cancer. Obviously, the victims in Concussion are a small minority of the population, but the film still motivates the audience to feel as though the issue is worth exploring given how much this sport is loved and even though its players often struggle with life off the field. NFL commissioner Roger Goodell is played by Luke Wilson (Meadowland, 2015), which is somewhat of a strange casting choice. Brooks is brilliant and intimidating as Omalu’s boss and Baldwin rounds out the contrast of these two doctors nicely. Smith’s performance in the lead role as Dr. Omalu continues to prove that he is a versatile talent. He fully captures Omalu’s Nigerian accent and mannerisms. In fact, he’s already received a 2016 Golden Globe best actor nomination. Bottom-Line? Concussion is entertaining, well acted and should hit home for the casual football fan and general audience. However, the film falls a few yards short of being a must-see during the holiday season.